There is a very popular saying, which is also a belief for many, "Marriages are made in heaven" but, there is also a quote by Clint Eastwood which reads, "They say marriages are made in Heaven. But so is thunder and lightning". Which of the above two do you believe in? Or would prefer to believe in? It may be a subjective issue for many, originating out of varied experiences on self and observations over a period of time. Don't the marriages usually survive the thunder and the lightning? Obviously they do, unless the amongst the two is causing it. I recently read Streaks Of Dawn, a book by debut author Anirban Chatterjee, a corporate professional based out of Kolkata. His book revolves around the phenomenons called love, relationships, marriage and how the mortal humans interweave all of these that too within the nutshell called society. Anirban Chatterjee has divided the book in four sections and thirty chapters wherein each chapter is dedicated to one of the many characters. The story of the book, Streaks Of Dawn mainly revolves around the life of Ayan, who is married to Hiya for around a decade, but is going through a rough patch both in personal and professional life. Ayan, in his very early thirties, has come a long way from being a shy boy to being popular among women while Hiya is a competent and experienced journalist who is committed to her work, equally to her family and instead of juggling between the two she efficiently and effortlessly manages the two. The other two couples in the story are Snehal-Rajeev and Jahnavi-Rajat, Rajeev is Ayan's one of the oldest friends and Snehal his wife. Jahnavi is Ayan's first crush(you can call it one sided love) from school days and Rajat her husband. Further, the story involves Snehal falling for Ayan, Ayan finally managing to speak with Jahnavi, Hiya moving on from the marriage and all the drama you would expect. What does Ayan actually seek, what does he get? Does he save his marriage? That is for all the readers to find out. 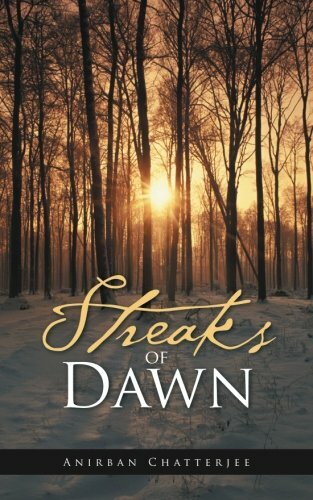 In a nutshell, the story of Streaks Of Dawn is about individuals being lonely in their respective marriages and seeking solace and emotional support out of it. The small chapters dedicated to a particular character helps in understanding them better, but leads to book being lengthier. The story is very modern in terms of its setting and reflects the diverse inclination of human emotions. There are several typographical and editing errors, which I am sure will be corrected in the next edition. The only part where the book became predictable was during the culminating chapters, and the end was very abrupt, a happy ending to the story out of nowhere. To conclude, the initial half of the book was nice, but the end could have been better. I would recommend the 234 page long book, Streaks Of Dawn to anyone interested in reading an urban fiction. Beautiful!! The Book seems to Interesting!!! Thank you, Tina Acharya! Do you share your thoughts about the book when you have read it. The theme sounds interesting, will read the book soon. Do share your thoughts over here when you have read the book. Thanks!